Leesburg Elementary School, Leesburg, Florida has been picked as the winner in Florida Wildlife Federation’s 3rd Kid’s Habitat Contest. The habitat consists of 6 different kinds of gardens habitats, a Butterfly garden, a Pond Habitat, a Bog Garden, a Wildflower Garden, a Florida Woodland Native Habitat Garden, a Florida Native Wildlife Habitat as well as a 1000 vegetable plant hydroponic garden. The site was planted and is tended by students, and was developed with the guidance of Lesa Roe, Science/Math Enrichment teacher. 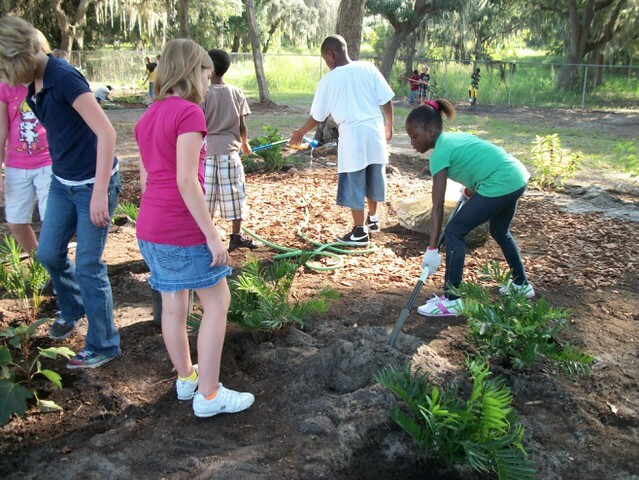 Each one of the habitat gardens is a re-creation of an ecologically different kind of Florida wildlife habitat. The diversity of these gardens provides an environment suitable for many different native species of Florida wildlife. The habitats area is used as an outdoor classroom for science studies as well as other nature classes. CONGRATULATIONS, LEESBURG ELEMENTARY from FLORIDA WILDLIFE FEDERATION!